This tool enables you to monitor your servers. The custom information are got by reading a web file. You can use a text file upgraded by your server or you can use for example a php file. You can color information line starting with one of the following colors: "RED:", "GREEN:", "ORANGE:" or "WHITE:". 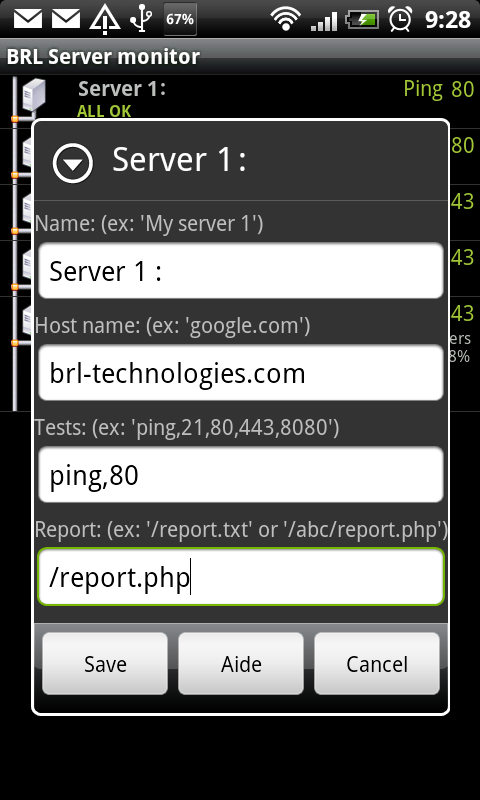 Create script who generate a "report.txt" file. Use this sample file: report.php and uncomment the features you want. In this file you have the functions: Hostname, Date system, Uptime, Load average, Apache CPU, Apache RAM, Apache PS, Mysqld CPU, Mysqld RAM, Mysqld PS, Max clients, Disk free.